Now that it looks like my gaming group’s long-proposed Knights of the Old Republic campaign may actually be coming to fruition, I’ve been stocking up on source books. The first of these is Star Wars: Threats of the Galaxy, which I hoped would provide me with a toolbox of non-player characters, monsters and other challenges that I could throw at my players. Threats of the Galaxy is a 160-page book printed in the same square, coffee-table book format as the core rules and the earlier Starships of the Galaxy rule book. The lion’s share of the book – 98 pages — is given over to a rogue’s gallery of villains and NPCs. There are also smaller chapters on monsters (28 pages) and droids (28 pages). Cover art for Threats of the Galaxy, a source book for Star Wars Saga Edition. Credit: Wizards of the Coast. There are the expected named villains drawn from the entire Star Wars expanded universe, such as Darth Maul (The Phantom Menace), Talon Kaddre (Timothy Zahn’s Dark Force Rising trilogy) and the Imperial Knights (Star Wars: Legacy comic books). These are nice to have, and I’m sure plenty of folks will love to use them in their games, but for me the real value of this book comes from its page upon page of generic stat blocks. From generic soldiers to elite Mandalorians to splicers to rogues to smugglers, the book has everything a game master needs to quickly stat out an adventure. In may cases several incarnations of a particular NPC are given; for example the solider has generic soldiers, elite soldiers and a number of special forces variants. The book offers potential opponents for every level, and provides a good breadth of low, mid and high level adversaries. That said, not every entry in this book represents a villain for the characters to defeat. In many cases, these are NPCs that a game master can easily pick up and use as is in a game. Need a splicer to help the party hack into an Imperial base? It’s there. Want a bureaucrat to run interference against the party when they try and investigate a New Republic senator? Done. The book could easily have been called “Challenges of the Galaxy” instead, though admittedly that doesn’t have the same ring to it that “Threats” does. While obviously oriented toward game masters, the book does introduce a number of new talents, feats and equipment that could be used by player characters. There’s the Malkite Poisoner talent tree for use with assassins and the Master of the Teras Kasi talent tree for aspiring martial artists. There are traits for the Chistori, Miraluka, Bith and a half-dozen other species, and equipment such as lightwhip, slicer gear, and Mandalorian armor. Each new item is listed on the same page as its used, so “riot shields” appear with the “security personnel” entry and “computer spikes” are listed with the “slicer”. This is all well and good – it’s nice to not have to flip to the “talents” section when running a martial artist. But the problem, as became all too apparent when writing this review, is finding these entries when you need them outside of their in-book context. The book has no index, no helpful listing of sidebars; in short no way of referencing all of these excellent entries. This doesn’t cripple the book, but it does make it much more difficult to find all of these crunchy bits. 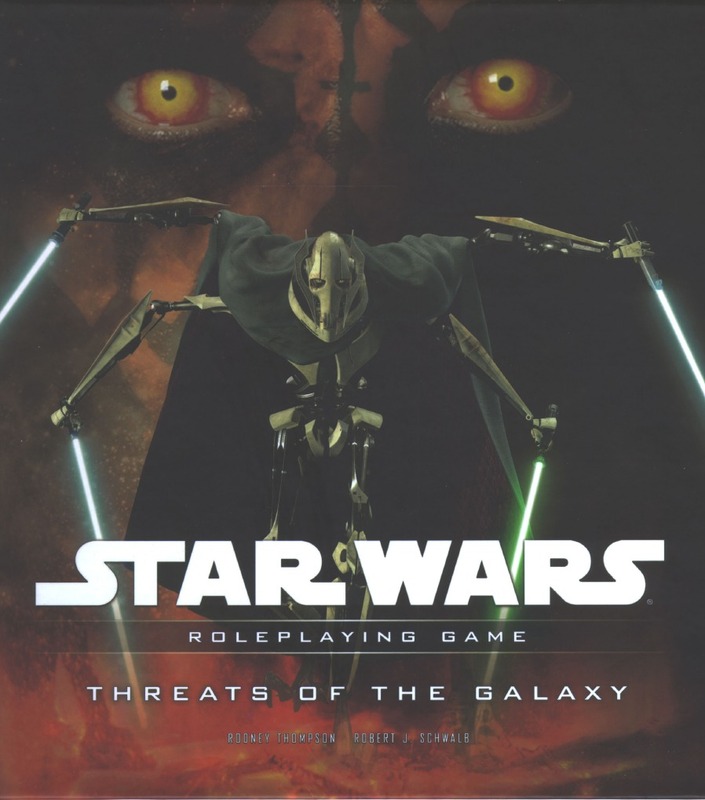 Now these write-ups are not without flaws; the guys over at the Order 66 podcast reported that their listeners had found problems with as many of 1/3 of the statblocks in this book. Most of the problems involve feats that the character doesn’t qualify for, or slightly wonky skill ranks. While it’s disappointing to see these kinds of errors (and on this scale, if the reports are true) I tend to agree with GM Chris and GM Dave at Order 66; it’s not the end of the world, and as long as the statblocks work as written (e.g. a Sith doesn’t have a feat that’s radically out of character for him to have), I’m ok with that. The book’s just too damn useful to get bent out of shape over a few miscalculations. A few folks have complained about the square-shaped form factor of the book (9.1 x 9.1 x 0.6 inches) but personally I loved it. The core rule book fit easily in one hand when I was running our playtest game, and I’ve found it’s easier to manage than a lot of my other full-size RPG hardcovers. It’s a cinch to fit in a backpack or briefcase, doesn’t take up much table space during lunch, and is easy to carry around the house. Admittedly, my situation may be somewhat unique — I’ve usually got a two-year-old riding on one hip — but it works for me. In spite of its flaws, Threats of the Galaxy is still a good source book for game masters to have on hand. Players may find it less useful – the feats and talents are nice, but they’re really aimed at NPCs – but GMs will find it a helpful tool for fleshing out their campaigns and speeding up game prep. Next Post:Playing for Keeps: Up, Up and Away!